In addition to the reporting tools here in Financial Aid > Reporting, there is also an automatic IPEDS Financial Aid report in Academics > Reporting > Preset. The Academic Progress report shows a summary of key academic statistics for the students enrolled in a given Academic Term. It is Populi's version of the Satisfactory Academic Progress (SAP) report. Read about setting up and using SAP policies and payment periods. Use the filter to sift the report by any of the columns shown. The Has Aid filter lets you look at students with specific award types. You can also filter by aid classification. indicates that the student has a current disciplinary action. Click Actions to Email or Text the students, Export a spreadsheet of the report, or Apply Discipline to the students (each action is filter-sensitive). When you apply discipline to students, those actions will be shown on each student's Profile > Student view. The 1098-T is a document furnished by your school to the student and the Internal Revenue Service to help determine a student's tuition deduction on their 1040 form. The deduction is based on the amount of tuition and qualified fees (Qualified Expenses Billed) for which the student was charged in a given calendar year and which were not covered by financial aid grants. Qualified Expenses Billed (tuition and fees, excluding the fines) of $7,000. Grants (Pell and Scholarship) totaling $2,500. Deductible education-related expenses (Stafford Loan and personal check) of $4,500. Who should get a 1098-T? 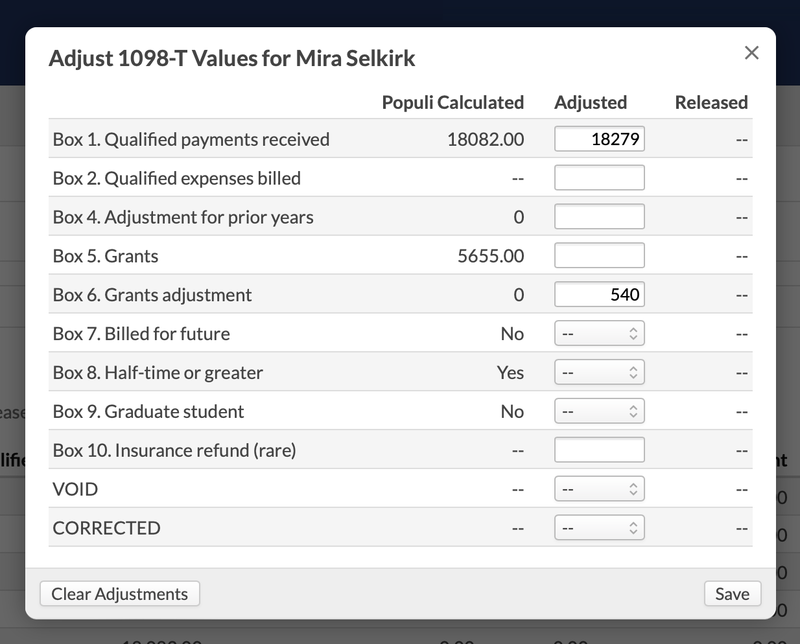 Populi generates 1098-Ts for all students enrolled in a given calendar year. However, if a student cannot claim a deduction for Qualified Expenses Billed, he can claim no tax benefit. Therefore, the IRS does not require a 1098-T from him. He has a Social Security Number. SSNs are given to citizens of the United States and those with a Green Card. You have charged him a positive amount of qualified expenses in a given Calendar Year. Per the IRS: "Qualified tuition and related expenses are tuition, fees, and course materials required for a student to be enrolled at or attend an eligible educational institution." In Populi, qualified expenses include tuition and any fees marked report on 1098T. His qualified expenses billed for the year exceed the amount of grants he received. He was enrolled in at least one course in that year in a program that grants academic credit. Populi generates forms for all students by default. However, you can enable or disable 1098-Ts for a individual student on their Profile > Financial > Dashboard view. Each column of the report corresponds to one of the fields in the 1098-T form. Select a calendar year from the drop-down. You may view, release, and export the data for a given calendar year only after it has fully elapsed! If you'd like to look at the 1098-T report for 2017, you'll have to wait until January 1, 2018 to do so. Use the campus drop-down to show it for students attached to particular campuses. To appear on this report, a student must have been enrolled AND have a payment made to his account sometime in the calendar year. If you check Include all possible students, the report will also show students who were either only enrolled OR had a payment made to his account in the calendar year (such students display in half-tone text and you cannot release their forms). indicates that the student does not have a valid Social Security Number recorded in Populi (this includes those with nothing entered and those for whom a placeholder SSN has been entered—e.g. 123-45-6789). You can enter one on the student's Profile > Info view. indicates that the values for this student have been adjusted (see below). lets you download a watermarked preview PDF of an unreleased form. lets you download a PDF of a released form. The report automatically gathers the information required to be reported from your school's billing and financial aid records—provided it has been recorded in or imported into Populi. 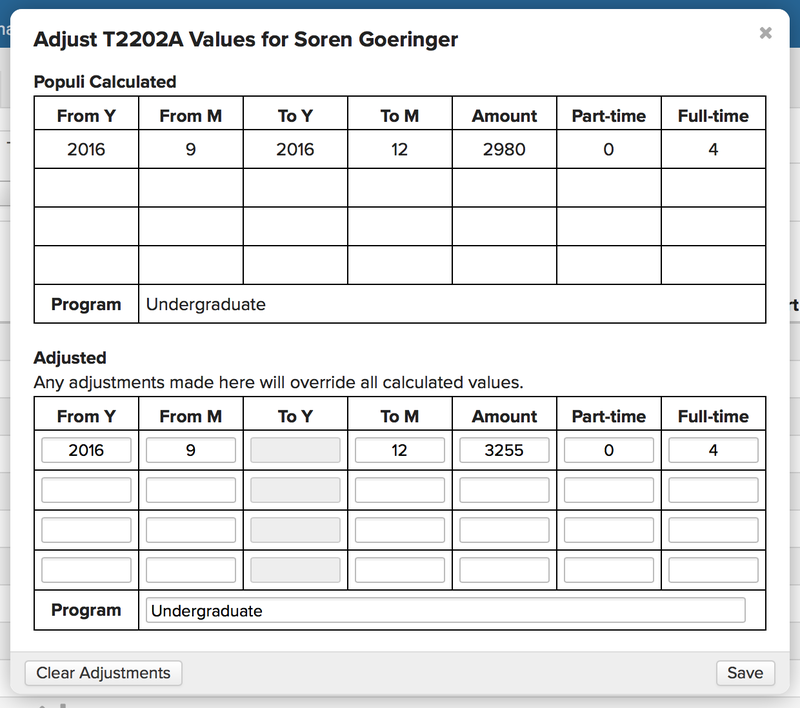 If the values shown for a particular student's form need to be adjusted (say, the record in Populi is incomplete), you can manually adjust those yourself. You cannot adjust values for a form that has already been released to the student; you must first hide/unrelease it (see Actions, below). Click next to the student whose values you wish to edit. Enter the adjusted value(s) as appropriate. Click Clear Adjustments to erase all adjusted values and go back to the Populi calculated values (this clears any previously-made adjustments as well). The symbol will appear next to the adjusted record. You'll find a record of all adjustments recorded in the changelog. Before releasing or exporting this data, please make sure you've read the most recent IRS 1098-T regulations (PDF link). Students flagged for not having an SSN can be released and exported. However, your school could incur fines for submitting such forms to the IRS. Students flagged for a placeholder SSN can only be included in the unofficial XLS export. Their 1098-T cannot otherwise be released or exported. 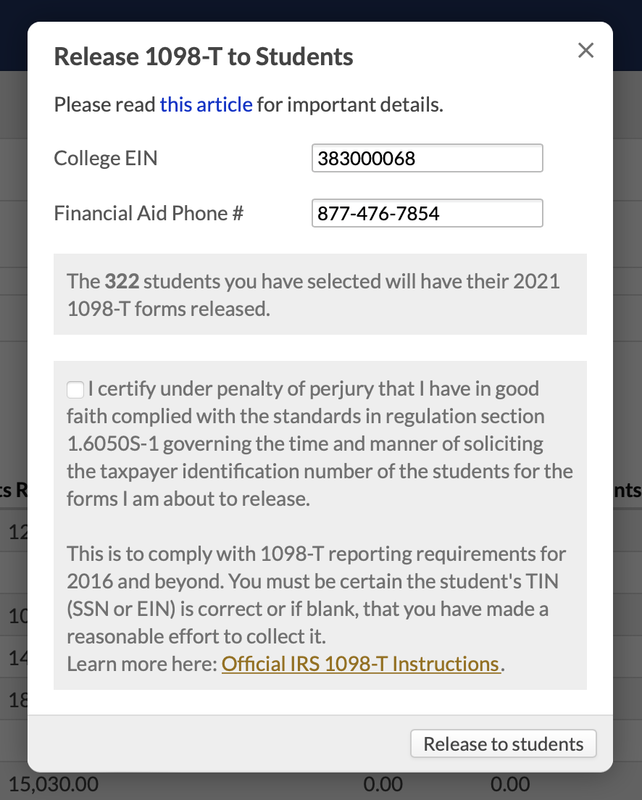 Before exporting PDF or electronic versions of a student's 1098-T (see below), you must first release the form to that student. Enter your school's Employer Identification Number (EIN) and financial aid office's phone number. Check to verify your compliance with regulation section 1.6050S-1. Students can now download their Copy B form from their Profile > Financial > Dashboard view. 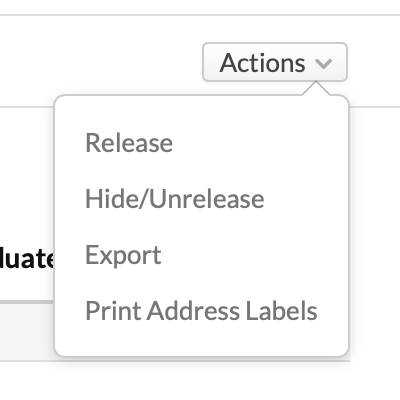 You will no longer be able to modify the information on the form unless you Hide/Unrelease it. If the SSN on the released form is incorrect, please read this article. You can Export 1098-T data in a few different formats. If there's a lot of data to crunch, the export may take a few minutes. 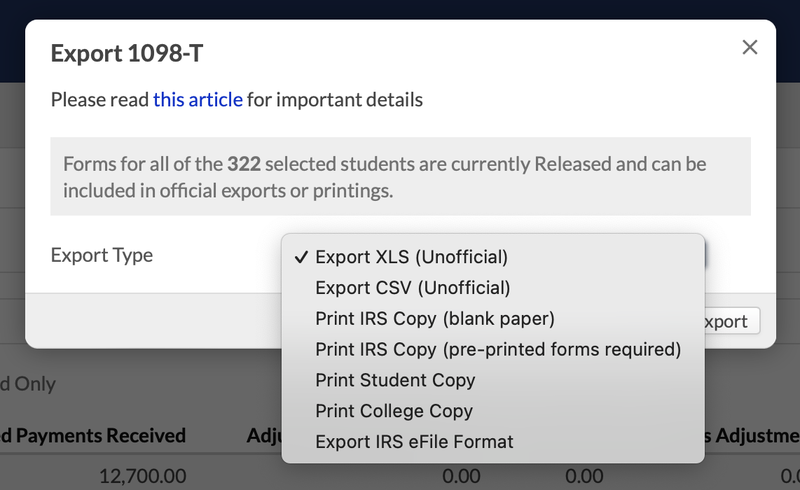 Remember, you can only export 1098-Ts that have already been released to students! Select the export format. Most of these require that you enter your school's Employer Identification Number and financial aid office's phone number. If you changed your school's reporting method this year, check the box to indicate so. XLS: creates a spreadsheet of the report that includes the students primary mailing and email addresses. IRS Copy: creates a single PDF of the data formatted to print on blank IRS forms. There are three forms per page. Student or College Copy: creates a single PDF of the 1098-Ts on the report that have been released to students. This option is exported on the standard IRS form. The Student option creates the Copy B form; the College option creates the Copy C form. IRS e-File: This exports a .txt file of all 1098-T's that have been released to students. You'll also enter your five-digit College TCC (Transmitter Control Code). This file can then be uploaded to the IRS' FIRE system. You can also check to generate a test file. Canadian schools have two additional reporting views: T2202A and T4A. Students can access their copies of these forms for a given year on January 1 of the following year by going to their Profile > Financial > Dashboard. To produce these forms, Populi adheres to the CRA regulations. The T2202A lets Canadian students claim a tax benefit based on their payment of tuition, fees, and textbook purchases. Canadian schools can issue T2202A's to their Canadian students; schools in the United States issue an all-but-identical form to their Canadian students—the TL11A. Both reports have identical functionality. Use the calendar year drop-down to show the relevant data for particular years, or the campus drop-down to show it for students attached to particular campuses. The Export options include XLS, Student copies (PDF), and College copies (PDF). The adjustment dialog looks like this. Even if you are only adjusting one value, you need to make entries in each field of the line you're adjusting. In the linked image, the user has copied all of the Populi-calculated values but has only adjusted the amount field. Click Clear Adjustments to erase all adjusted values and go back to the Populi-calculated values (this clears any previously-made adjustments as well). The T4A report produces both the T4A for Canadian residents and the T4A-NR for non-residents. Use the drop-down to toggle between the two. The Export options include XLS, Student copies (PDF), and Canada Revenue Agency XML. The CRA file requires you to enter the Payer's Account Number before exporting. indicates that the student does not have a valid Social Insurance Number recorded in Populi. You can enter one on the student's Profile > Info view. If the form hasn't been released to a student, you can adjust the values for that student by clicking . Adjusted forms are indicated by the symbol.